Magicians can use playing cards to perform some very interesting tricks, many of which would be easy for anyone to do…if they simply knew what to look for. With Suit Signals the magician is using the pips on the cards themselves as the trigger to amaze the audience. The magician shuffles the deck and then deals off a small packet of cards. He then mixes those cards up and invites a spectator to choose one and show it around. Once done the card is replaced in the packet, the packet is placed in the middle of the deck, and the deck is shuffled. With a quick motion the deck is fanned out and the magician quickly scans the cards and then picks out the very card the spectator chose. The small packet of cards was preselected and arraigned so that when one card is reversed it becomes obvious because the pips are pointing in an opposing direction to the rest of the cards. A normal deck of playing cards is all that is needed for Suit Signals. Here is the secret to the trick - the magician takes the 3 of clubs, the 5 of hearts, the 7 of spades and the 9 of diamonds and puts them together in any order. Examining the cards shows that all of them except the 9 of diamonds have pips pointing in two directions, up and down, and that each card has more pips pointing in one direction than the other (they are not evenly divided.) The magician makes sure that all the larger groups of pips are pointing in one direction, and then places the packet of four cards on top of the deck. 1)	The magician takes the deck of cards from the box and riffle shuffles them, taking care to keep the special packet of four cards on the top of the deck. 2)	The top packet is dealt off on to a table and the rest of the deck is set aside. The magician mixes the other cards, taking care to keep them all in the same direction. 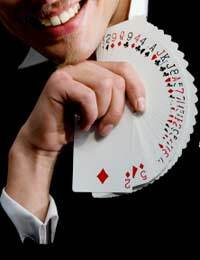 3)	The magician spreads the four cards and requests a spectator take one and show it around. While this is being done the magician secretly reverses the order of the packet in his hands. 4)	The spectator puts the card back - it should now be in opposition to the rest of the cards as to how it faces, up or down. 5)	The packet is returned to the top of the deck of cards and the cards are cut. They can even be shuffled if the magician takes care to keep them together. 6)	The deck is spread out and the magician goes through the cards. When he comes to the packet of 3 of clubs, the 5 of hearts, the 7 of spades and the 9 of diamonds he should notice one of the cards is reversed - if it is the 3,5, or 7. If so, that is the spectator's card. If none of the cards appear to be reversed, then the 9 of diamonds is the spectator's card. Practice cutting and keeping track of the packet of cards so that you can shuffle the deck after you cut for a more disguised effect.